“Gloria” was released by Island Records in most regions of the world, and a variety of promotional pressings exist. In many countries promotional releases are identical to commercial releases with an addition of a stamp, or a sticker. This was the case in Germany, where the commercial single from the UK was distributed in small numbers with a sticker on the vinyl and cover of the release. In the UK, a one-sided vinyl was pressed in red vinyl, with a punch out centre. This vinyl had either a white label, or no label at all on the back side of the release. The A-Side was just the studio version of “Gloria”. Also, two sided promotional releases exist in a silver moulded label, having the same tracks that were available on the commercial UK single. These were packaged in generic sleeves, and mostly used for juke boxes. In one of the earliest promotional recordings outside of the UK, a special promotional 7-Inch single was released in Argentina. 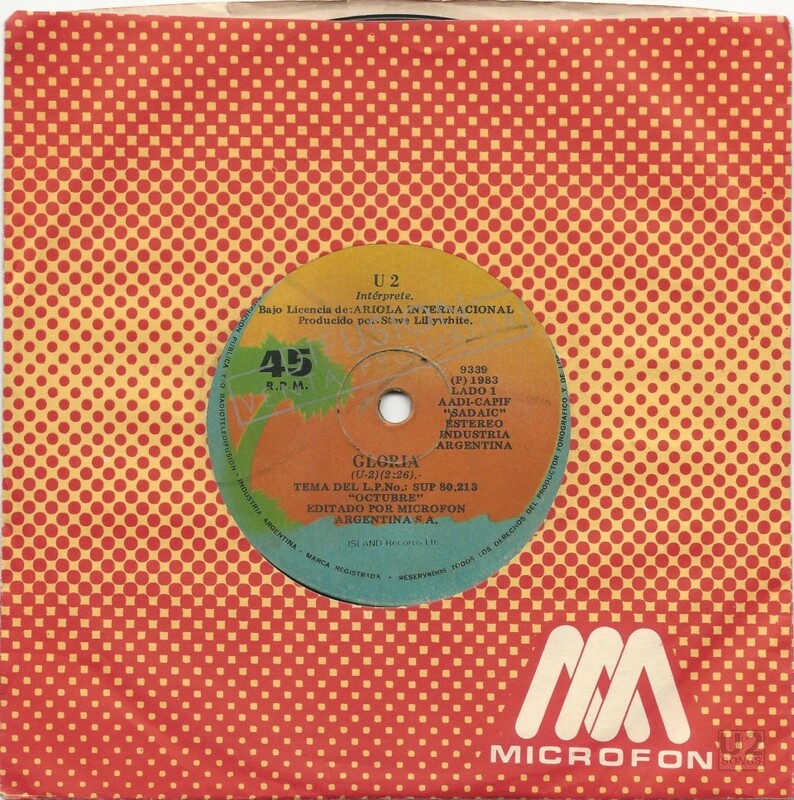 There was a commercial single which was released in Argentina, in a generic label sleeve, which contained an edited version of “Gloria”, as well as the song “Is That All?” (“Es Todo?”) Some versions of this single are stamped with the phrase “Diffusion venta prohibida” on the label which is Argentina’s version of the promotional stamp. The edit of “Gloria” found on this release is unique to these 7” singles, both the commercial and the promotional stamped versions. They also contain a unique b-side, not released in other countries, although this song is the same version that had been released on the “October” album.